Some work from home jobs aren’t available to California residents, reportedly for tax reasons. But not all, by any means. 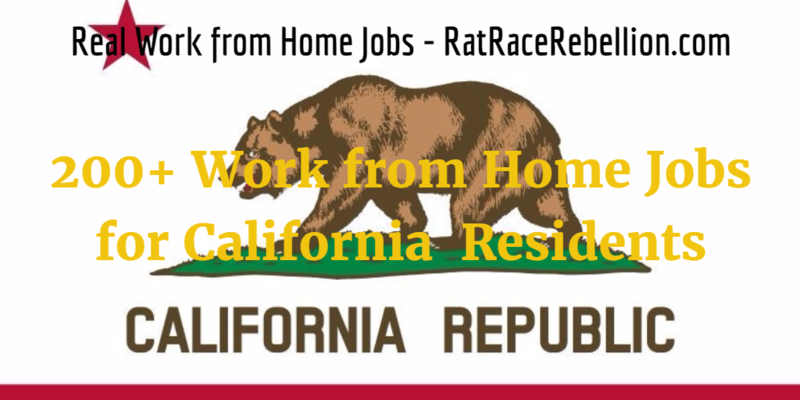 Here are hundreds of work from home openings that don’t exclude California. We post more to our Daily Jobs page every day, so be sure to check it often! At Home Advisors for Apple – Xerox is reportedly hiring hundreds of At Home Advisors for Apple. Per the job description, “This is a work from home position and we can consider candidates from across the US – you do not have to live in the city this is posted to be considered.” For the listing, click here. Friends or family in CA? Share this post with them! This entry was posted in Customer Service Jobs, Transcriptionists (Non-medical), Work at Home Jobs and tagged Jobs in California, LoveToKnow, Toptal, Working Solutions. Bookmark the permalink.